“Create My life in drawings, which resemble a collage. Draw My story with interwoven pictures, like a tapestry. I was intrigued. How would I accomplish this task? It was at that moment I decided to seriously pursue my art. My inspiration was and is rooted in my Christian faith. Although I had no formal training, I found that every time I put my pen to paper, a picture emerged. I saw a facial image gradually evolve from an obscure idea to a real work in progress. The process became similar to constructing a giant Jigsaw puzzle. After years of work, the result of this initial concept is titled The Divine Tapestry. This pen and ink piece has hundreds of “hidden” or intermingled pictures from both the Old and New Testaments. All the pictures combined make one large face of Jesus Christ. 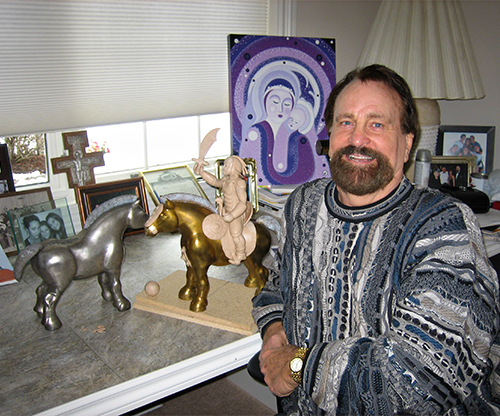 Most every sculpture, painting or drawing I do is also a picture embedded in the Tapestry. I prayed for a unique style, and over time I developed it. The Tapestry is now my signature piece. I work in a variety of media, but my latest technique is incorporating holographic materials in my paintings. Like a prism, the holography creates a shift in color and perspective, depending on the light and viewing angle. This process is a metaphor for my art – internal reflection resulting in external expression. I call this particular series Divine Reflections. I always strive for my art to be visually intriguing, and spiritually significant. I encourage viewers to not only search for the hidden pictures, but to explore the scriptures and symbolism behind each painting. When viewing my art, please take a moment to “reflect” on the love and saving grace that Jesus Christ has for you.